Help us to preserve the environmental integrity of the Heysen Trail and other walking trails in South Australia with a tax deductable donation. Your contribution, no matter how small, will help us to preserve and improve our trails for future generations. All donations are tax deductible. View Donation Options. The opening section of the Heysen Trail at Cape Jervis provides walkers with magnificent views across Backstairs Passage to Kangaroo Island, access to small rocky coves and patches of native scrub. Unfortunately, it is also the case that the coastal strip is severely degraded due to soil erosion, the activity of off-road vehicles and infestation by invasive plant species. There is a need to remediate this area to provide an attractive and welcoming experience for walkers that highlights the natural attributes of the Heysen Trail. 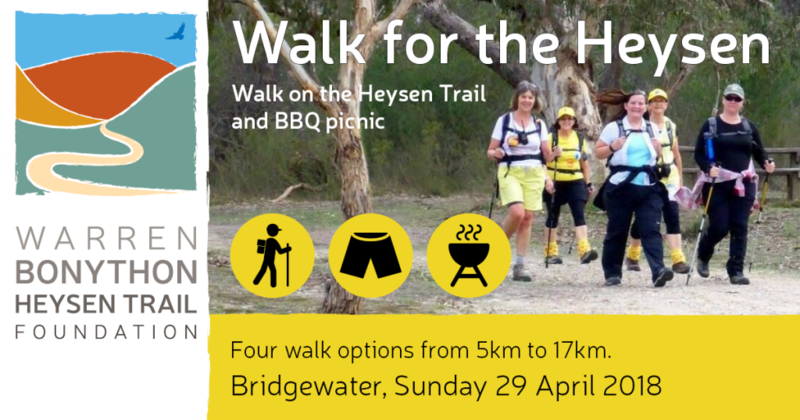 The 2018 “Walk for the Heysen” will be held on Sunday 29th April 2018 at Bridgewater Oval. This is the Foundation’s annual fundraising walk to support the activities of the foundation, focused at supporting the development of the Heysen Trail. The Warren Bonython Heysen Trail Foundation is supported by relationships with organisations that share its strategic goals. Find out more about sponsorship opportunities.